Why do skull icons appear on some video files? What could that be? I had an old CD from which I copied some files to my PC. While copying, Avast detected a virus named “Win32:Evo-gen [Susp.]”. Okay, but after about half hour I see that MP4 videos on my computer have skull icons on them and when changing the icon’s size the icons change to some danger type cross. I restarted my PC and the icons were gone. Then I ran a full system scan and nothing was found. Should I be afraid of something? i have exactly the same "problem"
i have VLC too. it's must be a malware on the videos or somthing like that. I don't think WMSRT is better than other third party good softwares. I didn't say its better but there are some specific viruses that some antivirus programs may not detect but WMSRT will catch. The best thing to do is run the third party software and then run WMSRT once just to be sure. which kind of files you copied from PC? I later found out the icons appearing were also in the CD. The images appearing on video are acutally .ico files which I also copied to my computer. BTW I copied every type of file including images, vidoes, .exe files, screensavers (It was one screensaver which was found as virus), fonts, audio files etc. Those icons aren't appearing again. But that is a question which needs an answer. Even It doesn't seems fit to call it a glitch. 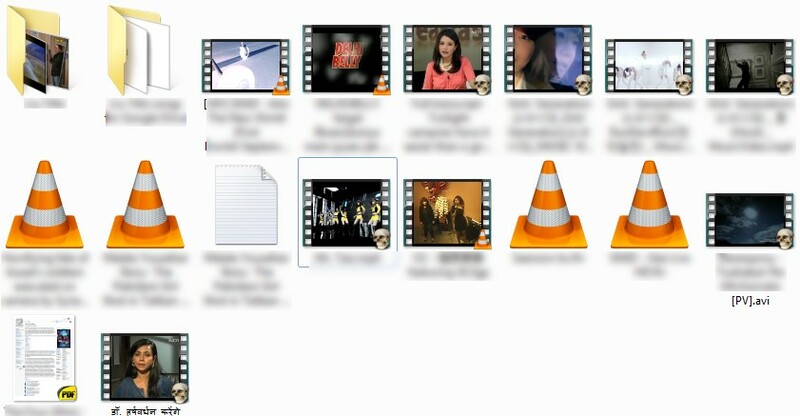 Why some innocent .ico files sit on my video files? An .ico files have nothing to do with MP4, AVI files. i remember having the same thing as you years ago cant really remember the reason? I'm on Linux now anyway. I'm always afraid of viruses. And Windows or other security softwares can't guarantee that I'm 100% safe. On Linux at least I'm kinda sure I don't have to worry much. BTW thanks to you for taking time and replying.